The air is getting crisp, the leaves are starting to change, and my husband is yelling at the TV screen again. That can only mean one thing — fall is finally here! Fall is my favorite season by far because of the awesome, seasonal flavors that start popping up in food (apple, pumpkin, cinnamon), and because there’s nothing like getting wrapped up in your favorite sweater and your most comfy jeans to watch a midday football game or to go to a fall festival. There’s no other time like it! Even though summer fun is over, you still have plenty of time to relax outside and have some good, frugal fun. Get outside and enjoy the cooler weather with these 8 frugal fall activities you can do with friends and family. My favorite part about fall is the arrival of all the local fall festivals. I love a good fall festival! Each year, our newspaper prints out a huge list of all the festivals coming up in the next few months, and I actually plan my calendar around some of them. I love taking my daughter to see arts and crafts, ride ponies, get her face painted, and taste fall-flavored food and drinks. It’s a great way to celebrate the upcoming cooler weather, and many fall festivals are free, which makes it a great family activity to enjoy. While apples are still in season, go and pick your own. You might not save any money from purchasing them at the grocery store, but the experience is well worth it. Apple picking supports local farmers, and it’s also great to know where your food comes from. Then think about all the goodies you can make from your haul! You can bake an apple pie from scratch, make homemade applesauce, or make caramel dipping sauce. It’s a lot of fun to make a recipe with apples you’ve picked yourself. If you’re still in the picking mood, it’s also fun to go pumpkin picking. Pumpkin patches are great places to take kids, and they provide ample opportunities for fall family pictures. Once you get your pumpkin home, take time to carve it and let the kids get a little dirty. Yes, it will make a mess, but it’s great fun to be had by all. Line your kitchen table with newspaper for easy cleanup later, and let the kids do all the scooping. They will love an excuse to get so messy. If you have older kids or competitive friends, try a pumpkin carving contest to see who has the best pumpkin carving skills. The winner gets a prize of your choosing. (A pumpkin pie or bag of Halloween candy.) Then you can start planning your frugal Halloween costumes or a Halloween get-together with friends. Where I live in the south, tailgating and football parties are practically a requirement come fall. Each person has their own team to route mercilessly for, and everyone likes to think of themselves as their team’s biggest fan. It’s just what you do. Football is king. Even if you aren’t heading to the actual game (which can be quite expensive), you can still have a memorable tailgate. Most of the time the tailgate is more fun than the game anyway! Have everyone bring their favorite tailgating dish, whether it’s chips and dip or a crock pot full of meatballs, and eat up. Don’t forget to bring the corn hole boards! Fall is one of the best times of the year to go hiking. The leaves are turning all sorts of colors, it’s cool enough to be comfortable, and you don’t have to worry about running into any slithering critters. Take advantage of this perfect time by taking a hike with your favorite people. Hiking is good exercise, which helps you feel good about your body. It’s also a great way to break up the monotony of a regular workout regimen if you need a change. Winter is ahead and before you know it, we’ll all be stuck indoors, so get outside while you still can. While you’re at it, if you’re a parent, create a scavenger hunt for your kids. Kids love a good scavenger hunt, and it’s a great way to get them outdoors and using their brains. It doesn’t have to be complicated, but it will definitely be fun. There are plenty of examples on Pinterest about how to create a fun scavenger hunt. You can either choose to create a more detailed version where they have to find and solve clues along the way, or you can simply print out a nature walk scavenger hunt page with objects to locate for the smaller crowd. If you’ve never been to a corn maze before, it’s definitely something fun that everyone should try once. Take along a few friends and, well, get lost. These things are typically huge, so they may not be as suitable for younger kids, but older kids and adults alike can have a lot of fun. Most of them have riddles to solve in order to make it through, and it can actually be tougher than you think. Start a fire in your fire pit, circle the chairs around it, and give everyone a stick and a fat marshmallow. Making s’mores or just simply roasting marshmallows over an open flame is a favorite pastime in our family. Kids love them, adults love them, and it’s super cheap. If it gets cold enough, you can break out the hot chocolate, too. Nothing says fall like a good bonfire and some roasted marshmallow confections. Whatever you choose to do this fall, try to have fun outdoors as much as you can. Before you know it, winter will be here and we’ll be dragging out the heavy coats and snow boots! 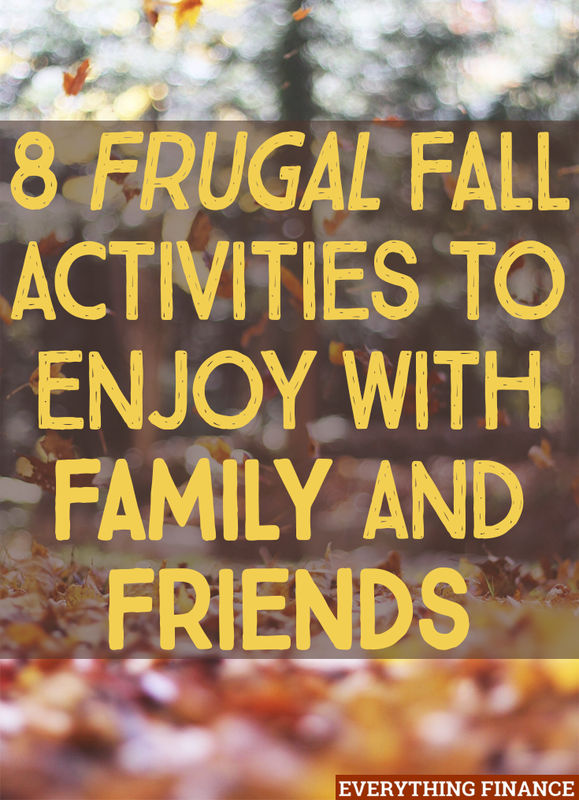 What are your favorite frugal fall activities to do with family and friends? Do you like getting outdoors for fall? Love the assortment of pumpkin and apple flavored everything? Going to the park– that’s one of our favorites, too! I like the idea of hiking this fall and I think this is the best season to do this activity, Robin. You know what I and my wife are now planning to hike while the weather is perfect. Thanks for sharing the ideas.